I’ve always had some kind of issue with my body. There’s a whole slew of stuff I could mention. I’m not an unhealthy person, but I have weird things going on with my body – I just take it as it is. Nothing in itself is life-threatening, except two allergies: bees and penicillin. I have other goofy allergies, though. I’m allergic to fake sugar. You know, that bold label on suger-free things that says, Phenylketonurics: contains phenylalanine.” There’s something missing in my blood that can process it into a “real” sugar. I don’t have PKU, which is an extreme allergy, just a low-tolerance of it. I used to work at a bookstore and would sometimes have to price the sugar-free mints at the registers. I couldn’t stay in the stock room for very long because the smell would give me a massive headache. Sometimes, when I smell it, the hair on the back of my neck stands on end. Creepy! I get sick if I ingest it, but no hives or anything. Just sick. Not that I mind too much, since there are so many reports of it being such a horrible thing for anyone. Same thing goes with vinegar. When I was in Japan, no sushi for me! I don’t go into a shock or anything, just get a really sick stomach. So, I say, I’m allergic. Honestly, I think my body has been telling me for years that I can’t handle vinegar because the smell repulses me. I don’t know how many times I’ve gagged when I smell sauerkraut (a staple in this Germanic region) or wings at Applebees. Yuck. Anyway, back to the point – I have a lot of joint issues too. Mom worked for a chiropractor when I was a little kid (pre- and elementary school) and I would get adjustments from her periodically. I didn’t know that there was anything really wrong with my body, just that it felt good and I loved sitting on that table where the roller would come up and massage your back. Loooooved it! I would beg to be allowed to lay on it while Mom was finishing up paperwork. I would also help mom out which included putting the number stickers on the patient files for quick finding (I was a beast at that….I guess I’ve always loved filing things). A lot of afternoons, I would just spend my time in the back office, drawing monster-long fairy tales on the dot matrix paper reams. That was fun. Growing up, I always knew that I wasn’t an athlete – especially not a runner. My ankles inevitably will twist or sprain after just a few short minutes running leaving me immobilized for only a few minutes – but it’s not my favorite thing at all. I don’t really feel like I’m missing out though. Sports are not for me. My forte was in music. I’ve played violin from 4th grade through high school and beyond. I love it. But my hands would get cramped fairly easily, my arms get tired and my shoulders sore. I carry a lot of my stress in my neck and shoulders too. I just figured it was how I was made. During my senior year, I really began to have serious pain in my arms and neck. Enough that we went to a pediatric rheumatologist. There was the awkward moment when we realized that he was a teaching doctor and had three med students accompanying him. He asked me how I slept at night and without thinking it through, I answered, “On my side, curled up.” He chuckled and the others stifled back giggles as I realized he meant the quality of my sleep. He then had me stand and go through some motions. I raised my arms straight out to my side and he reported that my pulse stopped. Intrigue! He had the students also check my pulse so they could see what it was like for someone with Thoracic Outlet Syndrome (1). It’s normally a condition for people who have an extra rib somewhere blocking their thoracic outlet, but for me, it was just another quirk. Before I went to Japan, I went to the doctor for a complete physical to make sure everything was good. He concluded that I was healthy as a horse, but my joints were in such a bad way that I would probably be in a wheelchair by the time I was 50. That’s only 21 year away. I do not want that. I want to be able to run (if the urge takes me) and enjoy life at that age, on my own two feet, using my own strength to get me around. While I don’t really think he was completely accurate in that prospect, it does make me think about how I treat my body now and what I can do to keep myself from that point in the future, near or distant. My church has started a relationship with a chiropractor group in the area called Baker Chiropractic. I mentioned them in the last post, briefly. Before the wedding, I started having a “catch” in my left shoulder which increased to some fairly regular discomfort and then pain up my neck and down my arm. So I decided to go ahead and make an appointment with the chiropractor. I was thinking it would just be a quick adjustment and I might come back in a couple of weeks if I started to feel poorly again, but they had other plans. I didn’t really know what I was getting myself into. I showed up, had x-rays taken and was ushered off to get a massage – that in itself was wonderful! Once I got an adjustment, I felt loads better. The next week, I went to look over my x-rays and discuss treatment. I don’t know if it’s from my hypermobility, but whatever the cause, my neck is really out of position. What I like about this chiro office is that I like to understand why things are happening, and they work hard to make sure the patients are educated about what needs to be done and why. I wish I had pictures of my x-rays to show you. 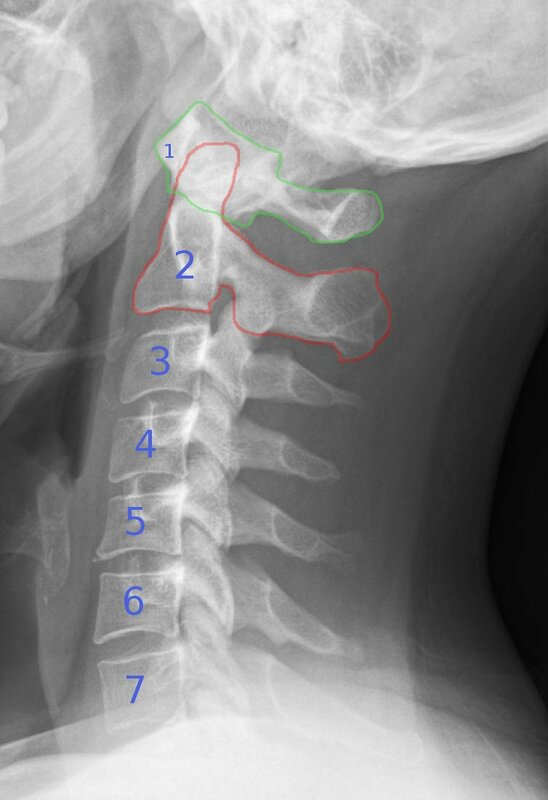 The preferred angle of a person’s neck is 43. The shot below looks fairly good. That angle is optimal. Mine, however, is in reverse, at a whopping -13*. That’s 50* off from what it should be. My lumbar curve (low back) is only 20* off and my right hip is just a little bit lower than my left one. I have a little bit of scoliosis too. I’ve started the full regimen of treatment: 3x/week visits, home therapy. Some of the home therapy is a bit of a challenge. I am a side-sleeper and I have some rolls that I’m supposed to use under my back and neck while I sleep instead of my pillow. That means sleeping on my back. It’s not comfortable at all. But there are other things that I can do that fit into my lifestyle more easily. I don’t know how much this will help my conditions. There are parts of it that I know won’t be fixed. My joints will always be too loose. But if I can get my body going in the right direction, then, hopefully, I won’t be stuck in a wheelchair by the time I’m 50. That in itself is worth it. (1) The Thoracic Outlet is the area between your neck, shoulder and chest. It is the corridor through which your veins, arteries, and nerves travel from your torso down through your arms. Thoracic Outlet Syndrome is when this space is constricted somehow, whether just by position, accident, or genetic condition. (2) Hypermobility is simply joints that stretch farther than normal. This can be isolated to one joint, many joints, or all over. It’s often just viewed as flexibility (think contortionists) but over time it can wear down the cartilage between joints and can accelerate osteoarthritis.